Brian and Jacob left Friday afternoon for their boys’ weekend, and Olivia and I had a girls’ weekend at home. Friday night, we stayed at home and had grilled cheese sandwiches and tomato soup (one of my favorite quick meals… makes me ready for winter!) followed by a coloring party with her new coloring book. Olivia has always been a fantastic sleeper, and she’s always ready for bed by 7 or 8, so she hit the hay around 7:45 and I had the entire evening to myself. Normally on a Friday evening alone I would get in my PJs, pour myself a glass of wine, and curl up with a girly movie like The Wedding Planner (one of my very favorites), Miss Congeniality, or What Women Want. However, since we are currently drowning in clutter and unfinished projects, I decided to use every single second of spare time to get stuff done. Or, DO ALL THE THINGS!!! !, as I like to call it. Y’all, it was completely uninterrupted free time and it was pure bliss. I got so much stuff done, including cleaning out my entire closet. I won’t bore y’all with every little detail, but I do have a couple of completed organization projects that I will be sharing later this week. Saturday, I awoke peacefully from a nice 8.5 hours of sleep, took a shower, and got totally ready before Olivia even awoke. On a typical Saturday, Jacob usually comes barreling into our bedroom anywhere between 5:30 and 7:15 AM, so this was the first time in months that I have been able to wake up slowly. We had a breakfast date with one of my friends and her two kids at Panera at 9, so around 8:30 I finally rousted Olivia out of bed and got her ready to go. After our breakfast, we headed back home and Olivia fed Maui some of her, "NAAAACKS!!!!" (snacks), and my parents stopped by for a couple of hours to visit. 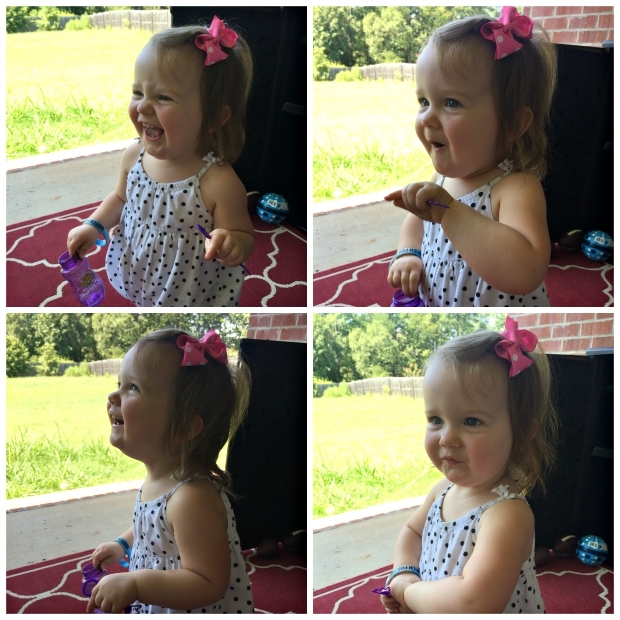 The weather wasn’t quite as hot as it has been, so we all sat out on our new back porch and let Olivia blow bubbles. This girl. Lunch was next, followed by some cuddle time and a nap for Olivia, and then she and I headed to church at 5:30. And good lawd, church. Homegirl was a wild child during church… she wasn’t necessarily misbehaving… she was just… lively, shall we say? Sunday was pretty low-key. Livi and I stayed home all morning and cleaned out her closet. It always makes me so sad boxing up their old baby clothes. And since she’s our last little baby, it was even sadder putting away all of the tiny clothes whose sizes end in months instead of “T.” She can still fit in a few 24 months outfits, but for the winter, it’s looking like she will be moving on to the toddler sizes. Excuse me while I go cry in the corner. Oh wait, I’ve already done that several times during the last few weeks. The booooys got home a little after 4 and I smothered my little munchkin in hugs and kisses. While I didn’t miss his whining, I sure did miss his face and his typical cute lil' happy self. He recapped his trip for Livi and me, and then he and Livi got back to their everyday antics of cracking each other up and ticking each other off. We ended the weekend at my parents’ house for our usual Sunday dinner, and boy, was it an extra special treat after missing it the last two weekends! We turned on our usual Tony Bennett Pandora station, opened a bottle of Malbec (that was divine, by the way), and we celebrated my daddy’s birthday with spaghetti, salad, bread with spices and olive oil, and big ol’ slices of double chocolate cake. It was a perfect ending to the weekend. I had so much fun spending the weekend with my best girl… it was nice to be able to focus on her, and only her. For the last month, it seems like it’s been all about Jacob – we spent an entire day with just him for his birthday and then we spent an entire day with just him for the Braves game last weekend, and we’ve been so focused on getting him started at a new school that poor Olivia has been on the backburner for a bit. It was nice for her to finally have my undivided attention. What a fun girls weekend! It's so sweet to spend one on one time with the kids and I'm sure Olivia loved having you all to herself! Oh, and grilled cheese and tomato soup is our fave!! Oh and your closet...Umm...can I just live in there? You'd be sad if you were to see my closet. It's a sad-oh-so-sad place...about the size of my pinky. HA! Your story about Olivia shaking it at church had my laughing. How super cute!!! She's adorbs! My closet in our last house was totally non-existent... I had to get a garment rack to hang in the middle of our spare bedroom because hubs' stuff took up our one tiny closet... when we built our house I told him that I wanted my own master closet and I wanted it to be big! Hahahaha.